The Partition of 1947 has influenced the works of an entire generation of writers, and continues to do so. Gulzar witnessed the horrors of Partition first-hand and it is a theme that he has gone back to again and again in his writings. 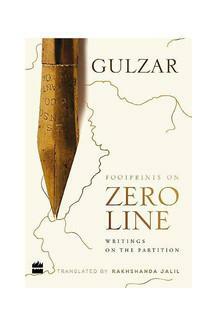 Footprints on Zero Line brings together a collection of his finest writings - fiction, non-fiction and poems - on the subject. What sets this collection apart from other writings on Partition is that Gulzar's unerring eye does not stop at the events of 1947 but looks at how it continues to affect our lives to this day. Wonderfully rendered in English by well-known author and translator Rakhshanda Jalil, this collection marks seventy years of India's Independence. Footprints on Zero Line is not only a brilliant collection on a cataclysmic event in the history of our nation by one of our finest contemporary writers, it is also a timely reminder that those who forget the errors of the past are doomed to repeat them. Poet, author, lyricist, film-maker, screenplay and dialogue writer, Gulzar is one of the towering figures of Indian cinema, culture and literature. Born in Dina (now in Pakistan), his career in cinema took off as an assistant to film-maker Bimal Roy. Apart from being a film-maker with a difference, he is undoubtedly one of the finest lyricists of Hindi cinema. A stalwart of Indian literature and one of the finest poets in Urdu/ Hindustani, he has a number of poetry and short-story collections to his credit. He has also recently published two volumes of his translations of Rabindranath Tagore's poems, Baaghbaan and Nindiya Chor. He is also one of the finest writers for children in the country. He is a recipient of the Sahitya Akademi Award and the Padma Bhushan. In 2008, he was awarded an Oscar for his song 'Jai ho' in Slumdog Millionaire. He received the Dadasaheb Phalke Award in 2014. Rakhshanda Jalil is a writer, critic and literary historian. She has published over fifteen books and written over fifty academic papers and essays. She runs an organization called Hindustani Awaaz, devoted to the popularization of Hindi-Urdu literature and culture. Her recent books include a translation of fifteen short stories by Intizar Husain entitled The Death of Sheherzad (HarperCollins, 2014) and The Sea Lies Ahead, a translation of Intizar Husain's seminal novel (HarperCollins, 2015).